The classic flavor combination of cottage cheese and chives is the basis for this great-tasting potato casserole. 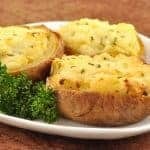 Baked until golden and bubbly, it’s a creamy blend of Yukon gold potatoes, cottage cheese, smooth-melting fontina and a generous helping of fresh chives to give the dish a mild, sweet onion flavor. 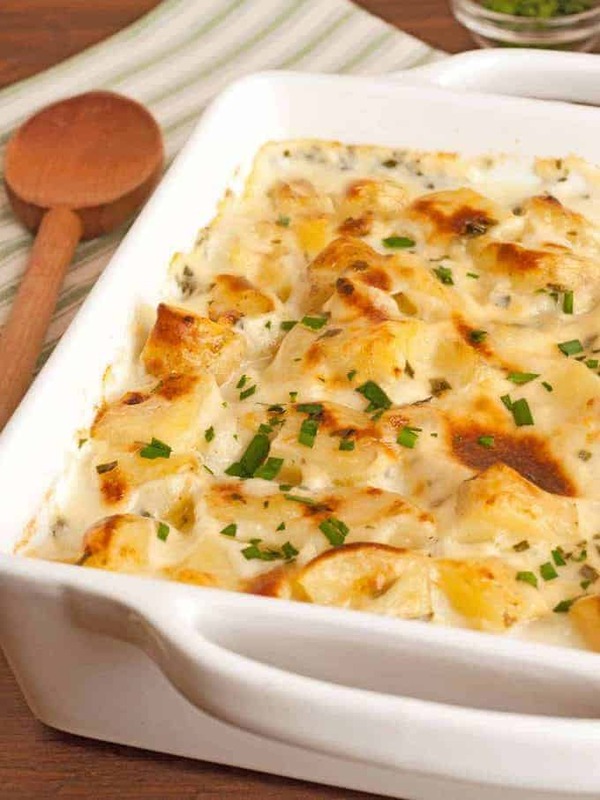 A creamy, cheesy potato side dish made with Yukon golds, cottage cheese, shredded fontina and fresh chives. Preheat the oven to 375°F and generously grease a 9 x 9 x 2-inch baking dish. Scrub the potatoes and cut them into 3/4-inch cubes. Transfer to a saucepan, add 1 teaspoon salt and cover with cold water. Bring the potatoes to a boil and cook just until tender when pierced with a knife, 12 to 14 minutes. Do not overcook. Transfer to a colander to drain and set aside. Melt the butter in the saucepan over medium heat. Sprinkle in the flour and blend with a whisk until well combined. Continue cooking, whisking constantly, until the mixture develops a pale golden color, about 2 minutes. Gradually add the warmed milk, whisking continually until smooth and well blended. Continue cooking, whisking frequently, until the sauce is smooth and beginning to thicken. Reduce the heat to low, add 1/2 cup of the shredded fontina and stir until completely melted. Add the cottage cheese, salt and pepper and continue stirring until the curds have melted and the sauce is smooth. Return the potatoes to the pan, add the chives (reserving about a teaspoon for garnish if desired) and combine thoroughly. Transfer the potato-cheese mixture to the prepared pan, smooth the top and sprinkle with the remaining 1/4 cup of fontina. Bake, uncovered until golden brown and bubbly, 35 to 45 minutes. 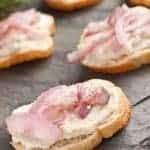 Garnish with extra chives and serve immediately.